Welcome To Our Complete Guide To The Wonderful White Cat Breeds. We’ll take a look at the best and most beautiful white cat breeds. Along with other cat breeds that can produce gorgeous snow white kitties. We will also investigate the tie between deafness and white color in cats. And how to care for white haired cats. Are you looking for all white cat breeds? What characteristics would you like in your white cat? And are you worried about white kitties and deafness? We’ll help you find the perfect, healthy white cat breed. 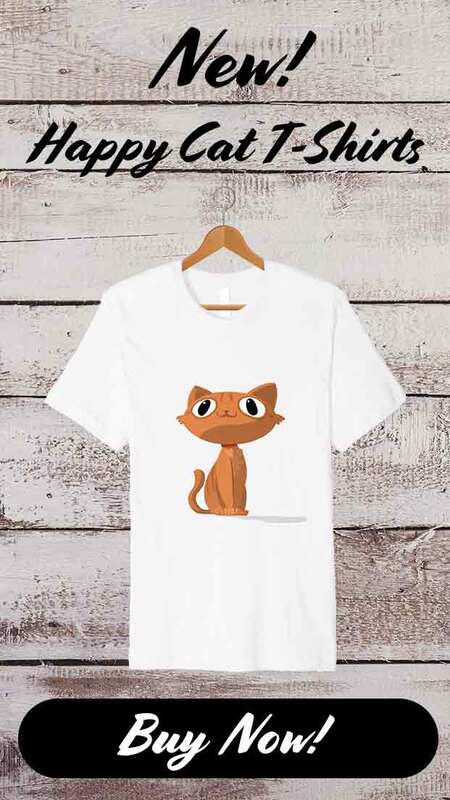 You and your stunning white cat will enjoy an affectionate companionship for years to come. You’ll find white cats breeds that are long-haired or short-haired. Soft or smooth. 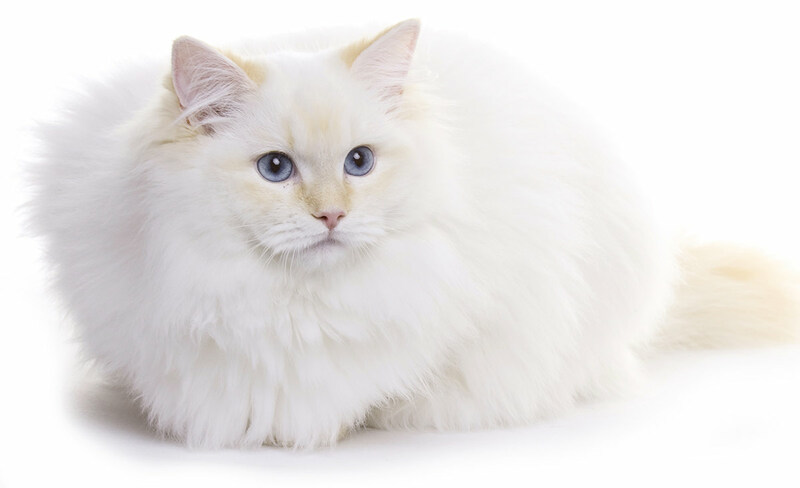 Some are a gorgeous example of the white fluffy cat breed, while others don’t have an undercoat at all. Pure white cat breeds also have a wide variety of eye colors. You will find green, blue or yellow. And even cases where one eye is one color and the other eye is another. But before you pick your purrrfect kitty, did you know that the eye color as well as the coat has a link to a sad problem? Some solid white cat breeds, but not all, have a genetic mutation that causes deafness in one or both ears. This most often occurs in white blue eyed cat breeds. All white cat breeds with one blue eye and one green/hazel, or gold eye may also experience deafness however. These cats are usually deaf in the ear on the same side as the blue eye. 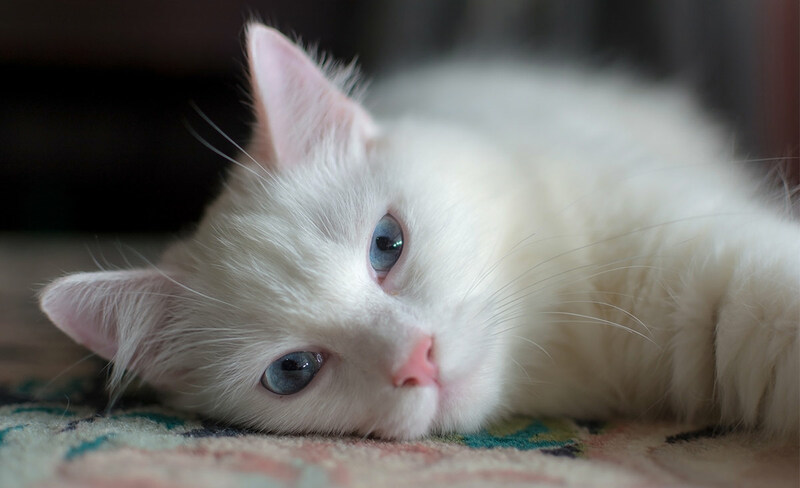 White blue eyed cat breeds tend to experience sensory hearing loss, meaning vibrations to the ear are not carried by the nerves to the cochlea. Cats may be deaf in one ear (odd-colored eyes) or may be deaf in both ears (2 blue colored eyes). It’s good to remember not all white cat breeds are completely deaf. Some cats may be deaf in only one ear. Some will not be deaf at all. 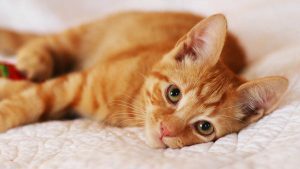 Hearing loss is something you will need to seriously consider as a possibility when you take on a white cat or kitten. So if you are planning on doing so, check out this great guide to Your Deaf Cat. 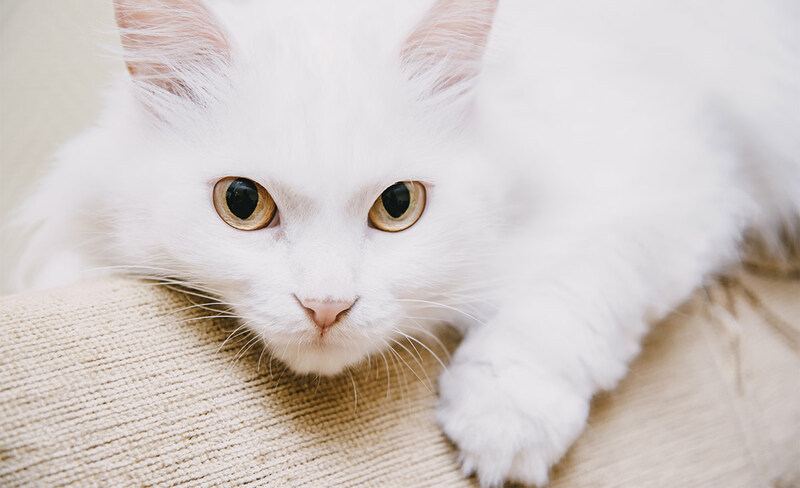 White long haired cat breeds come in several types–we’ll take a look at the Persian and the Turkish Van Kedisi all white cat breeds. Persian cats are a fluffy cat breed, known for their long hair, round heads, large eyes and flat noses. They aren’t all white, but plenty of them are. Persians are a beautiful ancient breed, originating in present-day Iran (in ancient times known as Persia). These cats are known for their dignified appearance, and have a sweet, quiet nature. They enjoy affection and petting. Persians are also good with children who are kind and respectful, but do prefer a quiet environment. They do however have some nasty health problems related to their cute squished in faces. 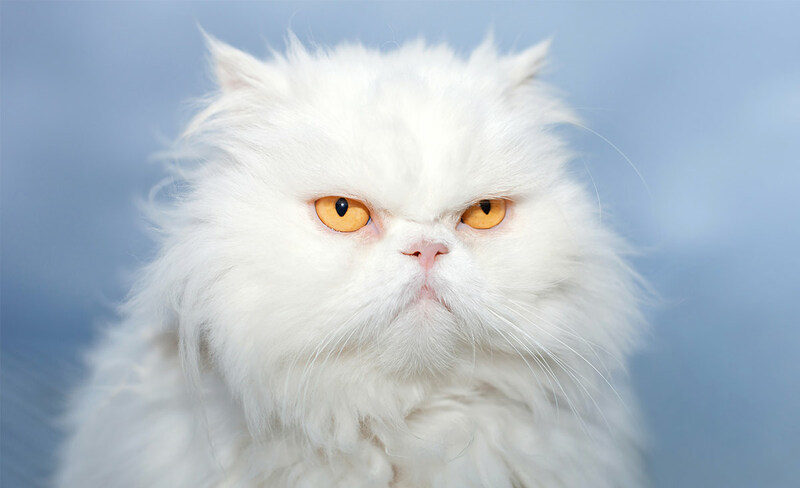 Check out this guide to the Persian cat breed to find out more. The Turkish Van Kedisi breed, also known as “swimming cats” for their love of water play, originated in Turkey. They are another white fluffy cat breed, from the rugged Lake Van area in Turkey. This friendly breed is extremely energetic and may be prone to causing damage inside the home. They are intelligent and enjoy learning tricks. These cuties are also loving and affectionate and will fit in well with families that have active children and cat-friendly dogs. 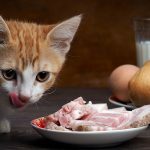 Find out more about the Turkish Van Cat breed here. 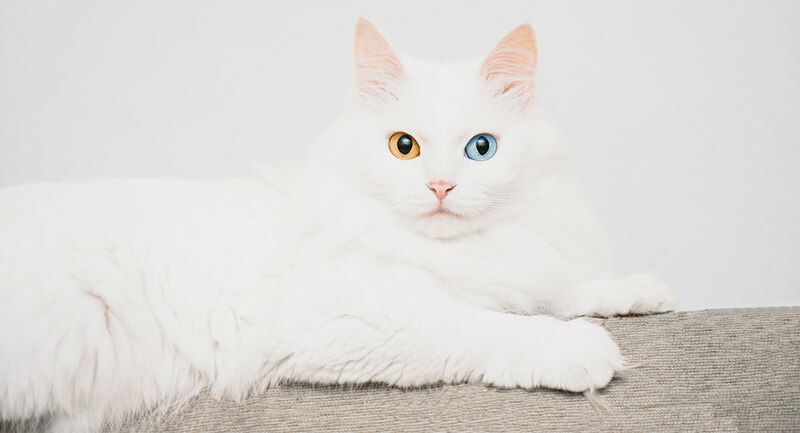 Pure white cat breeds come with eyes of many colors. Here we’ll take a look at solid white cat breeds with blue eyes. The Ragdoll cat breed is relatively new; this breed was first bred in the 1960s by Ann Baker in Riverside California. She bred large, long haired cats that had gentle, docile natures; the result is a large, placid affectionate kitty. These lovely cats called “Ragdoll” as they’re known for falling over in your arms when holding them. Ragdolls are affectionate and love snuggling. They aren’t one of the truly white cat breeds as they have marked points, however these can be very pale. Giving the impression of an almost white kitty. Ragdoll cats are great with families. They’re laid back with children, and they will get along with other cats and dogs friendly with cats. 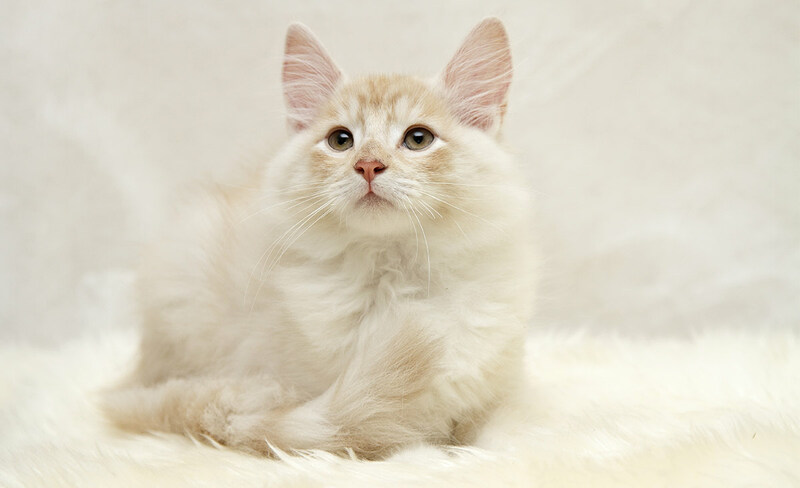 Check out our guide to the Ragdoll cat breed here. Turkish Angoras, another of the fluffy white cat breeds, are intelligent, outgoing and affectionate. This long-haired breed originated in the mountainous regions of Turkey, where winters can be harsh. They were almost lost, but were revived with controlled breeding programs set up in the 1950s at the Ankara Zoo. From there, the Turkish Angora was taken to the U.S., where it became a recognized breed by the Cat Fanciers Association in 1968. This breed is generally good for family with kids and cat-friendly dogs, who don’t mind them being in charge! Are you looking for a white cat breed with green eyes? Then consider the Norwegian Forest Cat, the Oriental Foreign White or the Russian White. The Norwegian Forest cat, also a white fluffy cat breed, originates from Norway, where it lived in the forests for thousands of years. This breed was almost destroyed in WWII, but was revived with breeding programs in Norway. Eventually Norwegian Forest cats were named the official cat of Norway by the late King Olaf. They aren’t all white, in fact many look more like wild cats. But you will find white examples within the breed. These cats are easy-going and great for families with kids. They also get along very well with cat-friendly dogs. Oriental Foreign White cats are known to be talkative and opinionated. These fun kitties are also known to be very loving with their humans. They enjoy supervising what their humans are up to all through the day. This breed is highly athletic and agile. You’ll find them capable of opening doors and drawers, and maybe even searching for shiny treasures to turn into toys. 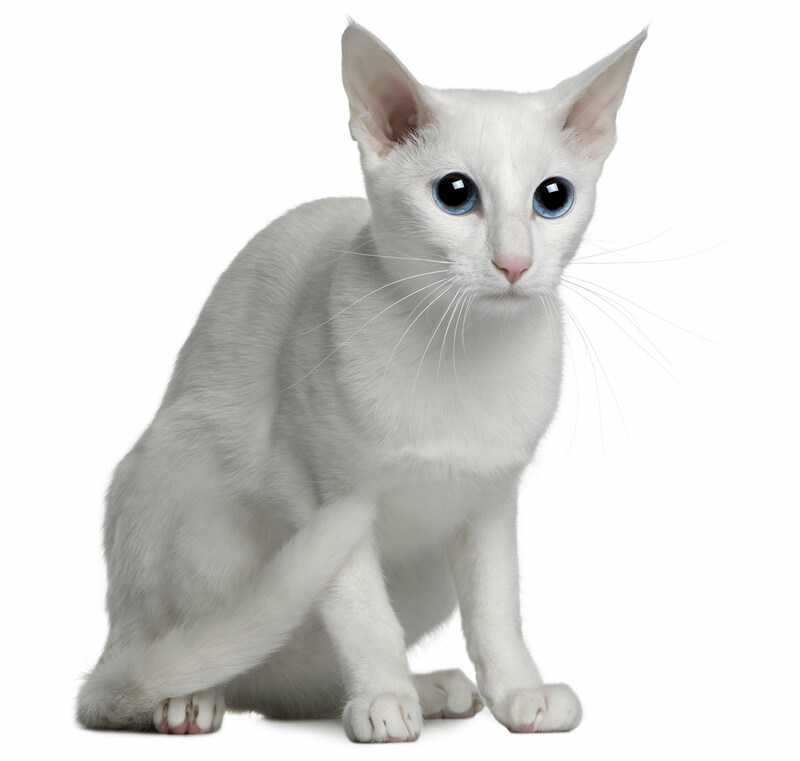 Foreign White Oriental cats are a great choice for families with kids, and will get along well with cat-friendly dogs. The Russian White breed, also known as Archangel cats, feature short white fur. Not much is known about this breed’s history, though they probably originated in Russia, near Arkhangelsk (Archangel), near the White Sea. Russian Whites are easy-going, so are a good fit for families with kids. They’ll also do well with cat-friendly dogs. Would you prefer a white tiger cat breed? Then check out the American Shorthair cat breed. They have some seriously cute white striped examples. This breed has a long history in the U.S.—even dating back to the Vikings, where they were aboard ship to help catch mice and rats. 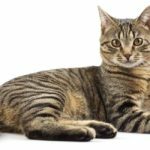 American Shorthairs are somewhat active, and you’ll find they enjoy mealtime. This breed is usually laidback and is a good choice for families with kids and cat-friendly dogs. White cat breeds with yellow eyes are beautiful and exotic. Consider the British Shorthair and the European Burmese pure white cat breeds. British Shorthairs are an ancient breed—originating in Rome, but later arriving in Britain. This is one of Britain’s oldest cat breeds. This breed was first recognized in Britain in 1980 by the CFA. This breed resembles a teddy bear, making you want to hug and cuddle them. These cats have sweet faces, typically with yellow or copper eyes. These relaxed, patient cats are known for forming strong bonds with their humans. British Shorthairs are wonderful for families with children and cat-friendly dogs. Maybe you live in a small house or apartment, then you might consider small white cat breeds. 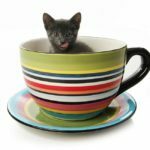 The Cornish Rex or Devon Rex may just be the right size for your home. The Cornish Rex cat breed is well-known for its curly coat and large ears. The Cornish Rex originated in Cornwall, England. The first Cornish Rex came from a littler of barn cats in 1950; the kitten was a male named Kallibunker. He was bred back with his mother (I know, right!) to reproduce the curly-haired mutation, leading to kittens with curly coats. 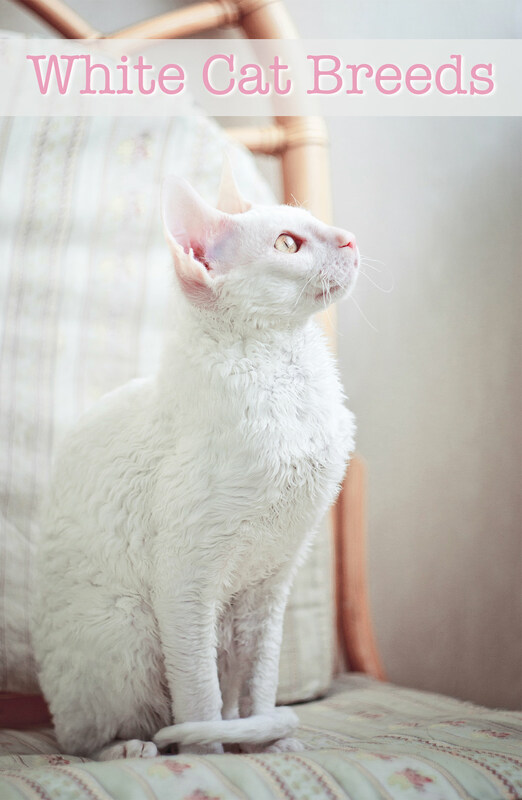 The charming Cornish Rex is great for families with kids and cat-friendly dogs. These cats love to play games, such as fetch, and can be trained to do tricks. 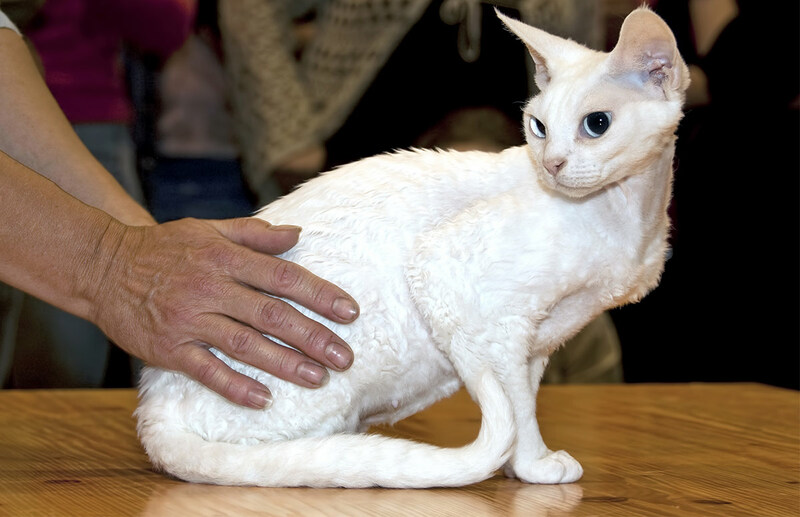 The Devon Rex breed originated in Devon, England and share some of the same genetics as the Cornish Rex. However, the original Devon Rex kitten, Kirlee, had a wavy coat, rather than a curly coat. The Devon Rex eventually arrived in the U.S., and was recognized as an official breed in 1979 by the Cat Fanciers Association. 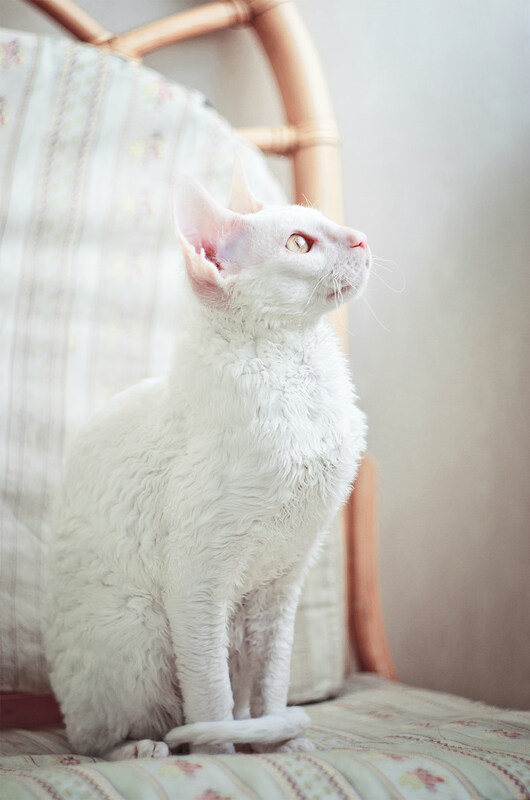 This breed is wonderful for families with kids, and the Devon Rex will also get along with cat-friendly dogs. We have already seen that white cat breeds can often be deaf. To see if your cat’s deaf, you might try clapping your hands or making another loud noise. Make sure she’s facing away from you. If she reacts, then she’s not completely deaf; however, no reaction may mean your cat is completely deaf. Be sure to contact your veterinarian with any concerns or questions you may have about your kitty. 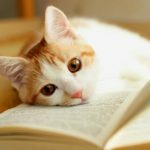 You can find out all about how to care for a kitty with hearing loss in this great article. But all white cat breeds can also face some other medical issues, including squamous cell carcinoma. Keep your white kitty inside and limit the amount of time spent in the sun, particularly between the hours of 10:00 AM and 2:00 PM. Another way to care for your cat is by grooming her coat. A white fluffy cat breed, with a thick undercoat, may need to be brushed at least twice a week. Other all white cat breeds with shorthair or no undercoat may need to be combed or brushed only once a week. All white cat breeds are also subject to eye tears and other stains on their faces and coats. You might consider using cat-safe tear stain remover wipes to remove stains from your kitty’s face and coat. All white cat breeds are cute—the important thing is to choose a white cat who suits your personality and fits in with your family (including other pets, especially cats and dogs). Remember to choose a white cat the right size for your home. And consider avoiding those with serious inherited health problems, such as those that brachycephalic flat faced cats can find themselves subjected to. We hope our white cat breed guide will help you find the perfect white cat breed, who will be your loving companion for years to come. Hartman R et al 1997. Response of the primary auditory cortex to electrical stimulation of the auditory nerve in the congenitally deaf white cat. Hearing Research. Bergsma and Brown 1971. White Fur, Blue Eyes, and Deafness in the Domestic Cat. Journal of Heredity. Rebillard, M et al 1981. Variability of the hereditary deafness in the white cat. I. Physiology. Hearing Research.